Nicole Bilderback is an American actress, known for her recurring guest roles on the television programs Dark Angel and Dawson's Creek, and the films Bring It On and Bad Girls From Valley High (aka A Fate Totally Worse than Death). She also was one of the Cordettes, Cordelia Chase's friends, on Buffy the Vampire Slayer. 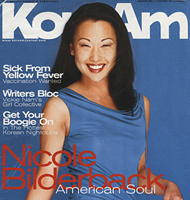 Bilderback was born in Korea and raised in Tulsa, Oklahoma and Dallas, Texas. She was adopted by American parents Jim and Lois Bilderback, through the Holt International Children's Services program. She was a cheerleader in junior high school and has two older brothers. She studied dancing from a very early age and at the age of 14 enrolled at the Dallas Young Actor's Studio. Bilderback appeared in Clueless playing the character of summer alongside Cher (Alicia Silverstone), Dionne (Stacey Dash), Tai (Brittany Murphy), and Amber (Elisa Donovan). She appeared on the August 2001 cover of KoreAm Journal, on issue 3 of the 2001 cover of Yolk, and as a medical student in House. Bilderback rode in 2002 Lunar New Year Parade and Festival.